You have two options when it comes to cages for chinchillas. You can build your own or you can buy one ready-made. We've actually done both. Our first cage was typical of pet store cages. Its dimensions measured 3 feet x 1.5 feet x 2 feet and it had two levels. It seemed to be a decent size for one chinchilla, but it didn't take long before we started to think about coming up with our own design. The main advantage of a store bought cage is immediate availability. Pre-built cages can also be reasonably priced given the economies of scale inherent in mass produced products. Our second cage was one we designed and built. We wanted to build something as large as possible, but still be small enough to move around our house as needed. This meant the cage had to be no wider than 2 feet so that it could fit through a doorway. The length was determined by figuring out what we could maneuver around the hallways of our home. This turned out to be 4 feet. And the height was also 4′ mostly because of the size of the materials that we selected (more about that below). The custom chinchilla cage we built has a 5-sided base (i.e. 4 walls and a bottom) made out of melamine. Melamine is particle board covered with white plastic that is easy to clean with Windex and a paper towel. To make moving the cage easy, we attached strong caster wheels to the bottom of each of the 4 corners. The sides and top of the cage are made out of white Elfa shelving you can buy from the Container Store. Holding the whole thing together are 1-inch square pieces of wood that run length-wise or width-wise throughout the cage. These pieces of wood also provide support for wooden shelves (4 levels) that the chinchillas can jump onto. The Elfa walls and ceiling form another 5-sided box that sits within the melamine base. Both the melamine bottom and Elfa have a door to allow for entry to and exit from the cage. To make the cage easier to clean, we put together a 5-sided wooden box which we filled with bedding as a cue to our chinchillas. The wooden box also has a melamine bottom, but it has pine sides since they're exposed and may be chewed. What kind of latch do you use to keep the door closed? The door is kept closed with a simple sliding bolt latch you can screw into the wood. Zip ties held everything together. can anyone give me a blue print on how to make a large safe enclosure for two chins? I would like to build the best one possible but need step by step instructions. what kind of tools needed and ect.. The walls of the cage would not be wooden. You will need cage walls (metal walls) so they do not chew their way out. Treated pine is the best kind of wood to use. There are woods that will make them sick. Pine is one of the safest woods! Keep in mind that chinchillas will chew the wood so ledges, boxes, etc. will need to be changed often. Treated pine or untreated pine? I always think of the stuff you build decks with that's treated with chemicals and that wouldn't be safe for chins. It should be UN-treated, yes :) Also called "furniture grade" or just plain "boards" at the hardware store... treated will be marked and you can ask an associate to help if unsure. Yes, I meant to say untreated pine. Treated pine would definitely kill a chinchilla. Sorry for that error! Shelia you really should remove the above comment completely and replace it with a corrected comment saying untreated because some people won't read beyond it to get the correction below and go out and kill their chins with the wrong wood. What is the bottom of the cage made of? i cant see that in pic..
amazing cage :) love this cage so much!!! Do you build them to sell ? I just needed to add a helpful hint here. I got chins as a young kid in high school, not knowing what I was getting into! I have now had the same two chinchillas for 15 and 16 years. During this time I found the hardest thing was having a cage that they were safe and happy in. The only option in my opinion is to make one yourself. I made several over the years and by far the best was buying a melamine closet from a hardware store. I assembled the back and the sides of the closet, turned it on its side and put wheels on it. For the front I used wooden painting frames (the ones for stretching canvas) from my local craft store. you can get them the exact width and height for the closet frame. I bought enough to make 4 doors on the front and framed them with wire. i used the melamine that was left over to make many shelves in the cage. Ta-da! Perfect, easy to clean cage with the entire front for chin viewing, yet closed in back and sides for ample shelves, toys and dishes, and the dust doesn't get all over the entire room. Hi Angela! I am not sure how old this post is or if anyone will even see this. But, I came across this and am so excited to make a cage like this for my little guy! I was wondering if you would take the time to help me out a little bit more. I'm looking for a melamine closet everywhere and I cannot find one! I've looked online as well. What hardware store do you recommend? Thanks. Hello, how is that cage working out?can you post a picture and the items used to make your fantastic cage? My biggest question and my biggest problem with my chinchillas the bedding and poo ends up on the outside of the cage so i have to keep them in a contained area of the house where there arent alot of people. I love my chins and i really would like to have them in the living room with the rest of us but i dont want the mess they seem to make with their bedding and poo. any suggestion would be great. Thanks. Why not just put down a piece of linoleum there (remnant) then you can just vacuum/wipe up any mess. What kind of cage do you have? What kind of bedding do you use? Are you using a slide out pan or a drop in pan? Wire flooring or solid flooring? I found it easier to make fleece liners, instead of buying bedding all the time. Much easier to clean, and reusable, too! Fleece is safe for chins, but in order to make these, you have to own a sewing machine. You can also buy fleece liners online from other chin breeders! This cage looks fantastic. 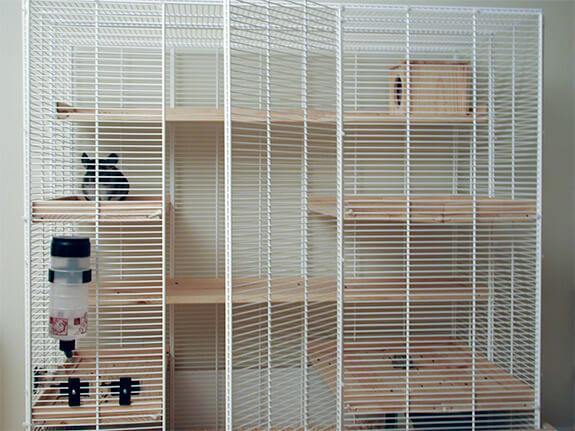 I like the elfa shelving for my home, so it would be great for a cage! Would it be possible to get more detailed information about how you made the cage. What you used, fasteners, etc. My family would like to get a chin pet and I would like to have making a cage be part of our preperations. I don't want to just buy something. Thanks. Your information is wonderful! Can you send me a picture of your cage that you described here? It sounds wonderful!! But I can't picture how you did the picture frames and how you got it to stay together. Did you weld it or how? I have found a chinchilla up for adoption but I want to sort out a cage for it first. It has to be big. I have an alcove in my bedroom where it would go but I've looked online and all I could find were terribly expensive small cages! I was wondering if you could send me a list of things needed to build a cage, where to get them and roughly how much they cost? Love, love, love this cage you built! Do you build them to sell? How much? So very interested in one like this! Are you still using this cage pictured here with the Elfa walls? Has it turned out to be the best you have used or have you found/made a better one yet? I love it for the most part though I wish we'd built a clean out drawer for it. I manage though by putting her into my hard cat carrier and then getting into the large cage with half my body, a spatula, hand vac, spray bottle of vinegar and one of peroxide and getting to work on it. I occasionally replace the shelves with more from Home Depot or Lowe's if scrubbing or sanding them doesn't do the job. The cage gives her plenty of jumping, running and variable sleeping room. She doesn't like to sleep in one place all the time so with this one she changes occasionally. I keep her bath in the bottom so the dust tends to stay low better that way not fouling up her flying saucer wheel's bearings up above that way. We've had the wheel for several years now and no problems with it so far at all. I forgot to include that if you can you should build an edge to all your shelves with kiln dried pine like the shelves if you can because a few times my girl has actually fallen deeply enough asleep to roll off a high shelf all the way to the bottom which is why I made her a hammock but although she used it in her old small cage she refuses to do so in this large cage. She hasn't been hurt yet but I still wish these shelves had low raised edges though that would prevent the poop from rolling off them into the bottom of the cage. She has a wooden house that she sleeps in sometimes but not all the time. I'm trying to build my own chinchilla cage. I have everything but the shelves and I'm having a very difficult time figuring out what kind of wood to use. I want to use white pine and I keep reading about how it's neccessary to make sure that all of the phenol oils are removed. I was wondering, is it absolutely necessary to use kiln-dried pine? It is extremely difficult to find and no lumber stores around me carry it. I have some air-dried "select" pine which seems pretty dry to me. It certainly doesn't ooze sap or anything like that. Do you think it would be safe for me to use that for the shelves? Kiln-dried pine is one of the best and SAFEST woods to use. Make sure that any wood you use is not treated (paint, varnish, etc.) You seem pretty well-informed, so I'm sure you know not to use plastic because of the terrible intestinal blockages that could happen, but just thought I'd mention it. Your local hardware store should carry some pieces, just make sure to ask and make sure! Good luck in building your cage! I'm getting a chinchila soon, would a dog crate be acceptable? There is an cage large enough for a Great Pyranees that I can get ahold of. I would build shelves and such for it to play around on. Or do they need the wire cages for some reason? While i clean my chinchilla cage a put it in the plastic crate but its cage is a wire dog cage. If it chews on the plastic i wouldn't keep it in there. I don't think that's smart becuase most dog craates are made from plastic and that can be harmful to your chinchilla. Dog crates are made of wire. Dog carriers are the plastic ones. I did the math on an elfa shelving house, and for the price per cubic foot and the effort might as well buy a double ferret nation cage. I have, however, come across another idea taken from sugar glider forums, PVC houses with mesh. There are plans for a nice large one here http://www.justforfuzzies.com/Other_Stuff/Cage/index.html and I figure with the appropriate wire, would work just fine. i agree that the PVC house is nice and ideal for a sugar glider. but chinchillas have very different needs in houseing from a glider. chinchilla cages need to have shelves and plastic like material isnt good because chinchillas like to chew, making the wooden shelves ideal. for a cage of this size it wont be cost effective, but im currently building one with 6ft X 20in elfa shelving and melamine boards and will be 60in wide X 63in tall X 20in wide. for this size i could not find a cage ready to buy for any cheaper. Using metal and wood only, and making the shelves replacable makes it more suitable for chinchillas than any ferret or bird cage. Plastic is toxic to chins. Metal cages are safer! How did you join the individuals shelves together, especially regarding the door. And how did you make the latch for the door? The first picture shows the front part of the cage. The other option if you don't overlap the front wire door is to run one of the wooden rods flush against the front of the cage from the inside so you can't swing the door inwards - I'd use one of the wooden rods along the top of the cage so you don't run into it when getting in and out of the cage. You might run one along the inside along the bottom too. It helps keep the loose litter from falling out when you open the door. This looks awesome! I have really been wanting to build a cage for my chin, as I can not seem to find one that I like or that I feel is big enough for him. Could you send me a list of materials and possibly where to find them? Also, I was really wanting to make a corner cage. Any suggestions would be much appreciated! Thanks! I bought the cheapest white shelving I could find (Home Depot or Lowes) and then used an angle grinder to cut off the lip piece and then used tie-wraps to hold the corners and shelves together. The wood shelves and supports give the cage structural integrity. You could also buy the more expensive pantry shelves or the Elfa shelving available at the Container store if you don't want to cut the lip pieces off. It is not a hard project. I put wheels on the bottom of my cage but then the Chins like to hide under it, so I would suggest off-setting the sides of the base box walls so the Chins can not crawl under it. I Made my cage 24" wide so it worked out that the black boxes that are used by the Nursery's to sell the 24 packs of annuals (flowers) in works perfectly to hold the litter in. I just put several of them along the bottom of the cage. I made a cage similar to the one shown except using the cheaper shelving available at Lowes, Walmart, or Home Depot. Thanks for the idea on the cage. The only issue with using the cheaper shelving is that you need an angle grinder to cut off the L-lip so that the shelving is flat (no lip). Using the tie-wraps to put the walls together worked great and I used that concept to repair my store bought cage. The advantage to making your own cage is that you can make it any size you want. Door closing question: The top of my door leans out a little bit since it isn't tied and our cage is 6' tall but the chinchillas can't get to that part of the door so no escapees yet. :) Otherwise the wood door holds the cage door closed just fine. If your in the St. Louis area, I'd be happy to make a cage for your chinchillas if all material is supplied. My only issue with the cage is that the chinchillas like to crawl under it and not come out!!!! I'm thinking off adding the rubber baseboard around the edges to keep them from getting under it and hoping they don't eat it too fast. Is anyone else having an issue with their chinchillas eating the drywall? My chinchillas have seemed to developed a taste for pealing the surface off the drywall and eating it. Our Chin-chin hasn't gotten to the drywall as of yet... He seems to enjoy attacking to molding around the house, he just loves to peel the wall paper on the the walls and eat it. But, his most favorite snack of all times is the antique furniture that we have around the house. I guess he prefers the aged wood. I'm trying to find a cage like yours that is for sale online but haven't had any success. I have seen the ferret nation and critter nation ones but they have ramps and holes in the floor; they're not really what a chinchilla wants. Do you have any suggestions? If you could send me some more detailed information on how to build this cage I would appreciate it. The Army has made it that I only know how to follow very simple instructions. I appreciate any help you can provide with this. How did you attach the top and the door ? How do you keep the door closed? On the wood edge on the outside of the shelves, how did you attach to the plywood without having any screws or nails sticking out? It is a very impressive cage you have there. Was wondering what is the material used for the cage? Does the frame of the cage come in stainless steel? Can provide me with the contact to the supplier? Is there anyway you could send me a link to the supplies you used for that cage ? I would like to build my own cage juset like the one above. Any coating can and will be eaten. The same with plastic and it can be very toxic to chins. Thus, there should be no plastic in the cage. As for the wood....my chinchilla would eat through that wood in a matter of days and I would find him rampaging through the house. Cages should be solid metal, no wood or plastic, with mesh ONLY on the sides. shelves of galvanized solid-piece steel are best, to eliminate the possibility of catching tiny toes. And the best wheels are solid ones, as large as the cage can accomodate. I just got my Pookie a flying saucer and he adores it. I just bought a cage that's about 2ft(l) 2 ft(w) and about 68inches tall. This is for one chinchila. Is this big enough or is it too big? I have one chinchilla, she's young so she's not quite full sized yet, but I'm wondering whether her cage is too small for her or not. It's 26in tall, 25in wide, and 14in thick. It has a base floor and two ledges above that. Will it be too small when she is full sized? I just adopted a chinchilla today and received the cage that the previous family had her in. There is Plexi glass in small to large pieces around the bottom and on one side. They did this to keep the family cat from being able to get to the little darling and I think that it would serve the same purpose that your wanting. I haven't noticed any major chewing marks. There maybe some but nothing that I feel I will have to worry about hope this helps!! Plexi glass can stain and it is semi expensive, look into sheets of the coroplast. My one chin only chewed on the plastic during the meet and greet of his new girl, he was upset that he couldnt be near her, the poor dear was so lonely! I had adopted him from a family that didnt have time for him anymore and he'd cry at night, until that is he got his girl :D Another alternative is those Snap together wire cubes. I would love to have more information on this cage. I have a store bought cage and have been happy but think my chinchillas would love the extra room. i can feel a pairing of 2 chinni's with 2 new cages of 460x700x1800 coming on here. I love to spoil my furry critters too. But the white coated wiring? didn't that pose problems with them eating it? I'd of thought bare or galvanised metal would be better. but deffo going to do. Compressed hay bedding? Is that alright? I'm thinking of buying a cage for a chinchilla it is 26 x 16 x 24 inches. Is that alright for one chinchilla? How about two? thats amazing! how long did it take you to make something like that! was it cheaper to buy a 2 story cage or all the materials to have a homemade cage? We made one like this, a little smaller, but still big enough for 2 chinchillas and it cost us about $60.00. We got the shelving at Lowes and it is put together with wood strips like shown on this cage. We didn't use zip ties as the chinchillas can chew on them and then the cage would fall apart. I got a big dog cage at a yard sale cheap and used the bottom tray for the bottom of the cage and we put thick plastic about 6 inches up on the outside to keep the bedding inside the cage. Our chinchillas love this cage. I've read somewhere that melamine poses a health hazard when ingested. My chinchillas like to chew on their cage wires. I'm worried that any exposure to a melamine cage will be more threatening than anything... what is your opinion on this? I was just wondering how you managed to join all 4 sides and the roof. Are they escape artist like hamsters? so do they like to run and hide? This is an awesome cage. I'm thinking of making a cage like this for my chinchilla. What were the parts you used and how much did it cost for those parts? Also, how do you clean the cage? id love to build one like that so i wouldnt have to buy a cage so expensive from a store. I would avoid doing what is in this photo. They used wood for the platforms which would become unsanitary and actually promote the growth of bacteria, mold, etc. Looks great, but I lack the skills to design one myself. Is there any way to get instructions to make your own? I'd be willing to pay for them, I just cannot find anything online. You guys have a SWEET cage! I wish I could have something like that. I have a question: I heard that chinchillas like being in corners. Like, you have to put the cage in the corner of your room. Is that true? It depends on the chinchilla. Hello! I made a wooden cage but he always eats the steps and edges. What can I do so he doesn´t do this anymore? Wooden cages are perhaps the worst idea for chinchillas because they can chew their way out. i do however like your building a cage idea, man i wish i could build. i have a chinchilla and gitting a mate for him... there really cool and i ned a bigger chage.... any ideas? I was wondering how I would purchase this cage? I may be buying two chinchillas male and female and I think the bigger the better ! What a great idea to build your oun cage. You have inspired my Dad and I to build a cage for our chinchilla boys.I was wondering how hard it was to assemble? Did you learn any lessons that you care to share? can you make urine guards to fit ferret nation for my chinchillas. Well i got one at a garage sale and it is 6 feet tall and really wide and has a lot of levels to and has a tunnel and places to sit in and my chinchilla gracie loves it but once they first get her in the new cage the can get sick because the need to addapt to the cage it will gets be their poop will be a little gooey and thats it. it is over in about 2-3 weeks and ur chinchilla will luv it!!!! i would love to buy one.. where can i get one??? Okay, I really love the work that you did with this cage. I do want to know where you got the matierials to build it though? hi, umm but doesnt it get stained with the chinchilla piss?? Where do you get the materials (Melamine, and Elfa) for a cage like this?? You did a great job! Hi I am interested in finding more about the chinchilla gage wooden sides? how much are they? How can you purchase one is there a telephone number to ring? can you give better instructions to build the cage you have above? I originally posted asking for the dimensions of the cage to make one but I have a feeling the original picture poster never comes back to check the comments left. So, I looked carefully at the picture to figure it out. First, since The Container Store isn't located any where near me, and it would have been a huge amount of money to ship the shelves, I did some searching. I found ventilated shelving at The Home Depot and I'm sure Lowe's carries them as well. The exact dimensions of the cage used are 56" in length by 2' wide and 4' in height. Take a calculater with you because you will need to have the store cut the ventilated shelving into 4" sections in height. You will also need 2 shelves for the top, based on the size of the cage you are interested in. The shelves are attached with zip ties, also found at Home Depot. I was not able to locate the melomine that she uses for her sides that was large enough for the bottom of the cage (store didn't carry it) and used a sheet of formica, formica is thin, so you will need to used something under it to stabilize it. The melomine, I did use for the sides but you will need to see what it available to you in the store and figure how it needs to be cut down to fit. Companies that sell signs carry a product called coroplast that you can use for the bottom. It comes in a flat sheet and can be "scored" so that it will bend. I haven't done this step yet but in my research of cages, have read that this works great to sit down in the cage for easy clean up. Please keep in mind when building this cage that you WILL might need some experience with carpentary work as my husband does construction, HOWEVER, before he was able to get to bulding the cage for me, I put the shelves together and placed the cage on a large hard plastic sewing/cutting board that I have. You just will need something easy to wipe up that will not absorb urine. The orignial poster includes details about the wood used for shelving etc, so I would follow her guidelines for this area. We spent about $150.00 total. I hope that this helps. I wrote it quickly, so if I missed anything let me know. Please feel free to contact me with any questions at dreambabycovers@aol.com. Included Chinchilla Cage in the Subject title or it will be deleted. I absolutely love your cage and I am sure that Sparky would too. I was wondering if you would be willing to assemble another for purchase. It would make our chinchilla very, very happy. Can you tell me the exact dimensions of each of the shelves used? I know that you mentioned in your details, the height of the shelves. I am on The Container Store website but it is hard to tell from the picture of your cage what the width of each of the shelves you have used are. awesome cage! i already have 2 chinchillas and i wanna build a bigger and better cage! But did you use a bird cage for this? I think how the door goes from the top to bottom, better then my cage which has 2 doors. So whenever i open lets say the bottom door to get my chinchilla it runs to the next floor up so i have to close that door and open the top door and then it run back down to the bootom floor! Anyways if it is a bird cage, could you tell me where you got it from? Somehow, I don't see that happening for you unless you study long and hard! I am interested in obtaining a chinchilla cage like the one you have pictured. what would something like this cost? Hi I really need to build a few large cages I want to be a future small hobby breeder and I have a boy and girl now (girl is spayed) but I dont house them together I want to build three very large cages one for boys one for girls and one for babies can you please send me your plans and the name of the store you bought the white Elfa shelving at?? It says in the description that you buy the Elfa from The Container Store. And if you read previous comments they don't have any plans, sorry. Great Cage! I have a question though, how are you attaching the Elfa to each other? In the description it says that it is due to the 1 in square pieces of wood that runs along side the shelving, but is that it? And what about the top of the cage? Zip ties hold pieces together where needed. They're also used to allow for the front center panel to swing open. Some zip ties get chewed so you have to be strategic in your placement. Zip ties could have lead in them so I would not recommend using them. I'm getting a chinchilla. You guys have a great cage. would you send to get a copy of the plans or at least let me know if I can buy a premade cage ? Awesome cage. Could you please email me the plans? My 3 chinchillas would appreciate it. Nearest container store is in San Antonio, looks like a road trip is in order. Where did you get the wire for the sides of the cages? I'm in BC, Canada and I have noooo idea where to get it. I'd also love to get a copy of the plans or at least some more photos showing the entire cage from top to bottom. You have come up with a really excellent idea here. We want to build our Chins a new habitat as we're sick of the one we purchased. It's too hard to clean and there's just not enough room to offer them the types of fun toys we want to give them. It's also rather unsightly. We solved that problem easy though--we bought a computer armoire and built it out to accommodate the cage and set the cage inside on the top half--we left the doors off. We are planning on still using it to hold the new habitat...our Chinchillas really love the dark and love to have three walls around them. We also have added a sheet that hangs down in front of the cage during the day so they get the full darkness they like in their nice cool room. But really...it needs to be bigger...we also need to add a mesh bottom...the cage we bought has them living in their toilet! hi i was wondering if you guys would be kind enough to email a pdf to me of the plans of the Chinchilla cage please it would help me alot thank you!!! could we get some plans also this would you mind posting this on instructables.com ? Sorry, but we built the cage as a one-off for our chinchillas. And we sort of put it together with only a basic idea of what we wanted so there are no plans. The "walls" can be purchased from places like Home Depot or the Container Store. The cage is not for sale. We only made one. theyre probab the cleanest creatures they have the softtest fur in the whole entire world and has no smell entirely. Not true! Chinchillas do too stink. They are not as bad as mice, but since we have two (together) the cage reeks in just a few days. People know we have rodents in the house when they just enter the door. The smell is kept at bay with dilligent cleaning a few times a week. I do not recommend chinchillas as pets for children since they aren't good at cleaning cages etc. This website has helped me a lot. I just got my chinchilla for my birthday and this website has helped me give her the best life. Chinchillas work really well in pairs, just introduce them slowly so you don't stress them out. I currently have 8 and they are paired off into different cages and love the companionship. If you are unable to get a second chinchilla you may want to try leaving a radio on with soft music. Hey! I was wondering if you sell cages or where did you get the custom one made?I love that design! I'm looking for a good cage, because all the other stores and things sell cages with plastic on it. Every body knows that if you own a chinchilla, NO PLASTIC! Am I right? Thanks so much! Please respond!!!!!!!!! I found out what was the problem to my chinchilla's fur loss, and from checking multiple sources, I'm guessing that it's fur chewing. And because fur chewing is caused by boredom, I need some way to keep him from being bored w/o taking him out to run. (He goes completely wild if I take him out for long runs). Any suggestions? How much plastic did he eat? How long have u had your chinchilla?? Thank you for sharing your cage idea. My husband and I are going to try to make one, also! Chinchillas seem to thrive better in long rectangular cage environments than basic square cages. If you've been able to improve upon your design, please let us know. Most sincerely, Sandra. I was wondering if plastic would harm your chinchilla in any way because this seems like it would be easy to clean. The cage that was hand made looks great and has lots of room for the chinchillas to excercise. My question is about the wooden shelves - how do you keep them clean? I have seen chinchillas in cages with wooden shelves and the shelves were stained and dirty. I know that chinchillas like to chew so is there any kind of plastic shelving that would not harm the chins? I am opting on how to change or remake a cage for the two chinchillas I have now. Please advise. Thank you! New owner of a chinchilla and would also like to know if you sell your cages, if so how much would it be to shipped to Hawaii? Thanks!! could you tell me how much your cages are because im geting a chinchila soon thanks?? Can Yall Send Me Blue Prints Of The Cage yall build and list of materialsa used Please? hey im gunna get two chinchilla's in a few days! and i was just woundering do u have any cages for sale? i have recently bought a chinchilla albino. she has a fairly big cage but all of my family would like her to have a bigger one. could you give me any advice on building my own as i feel it means more and my chinchilla will have more adventures in it. does it chew on the wood. Do you have cages for sale? We have been raising chinchillas as pets for over 6 years and will soon be moving to a new home. We don't have time to build again. The cage you show on your website looks well thought out. Gorgeous cage and very inventive! I dont doubt that it was expensive though. I am curious about something... I have a 20 gallon tank that was previously used as a rat cage (top open... and if we were to get a chinchilla, it would definitely get a thorough cleaning! 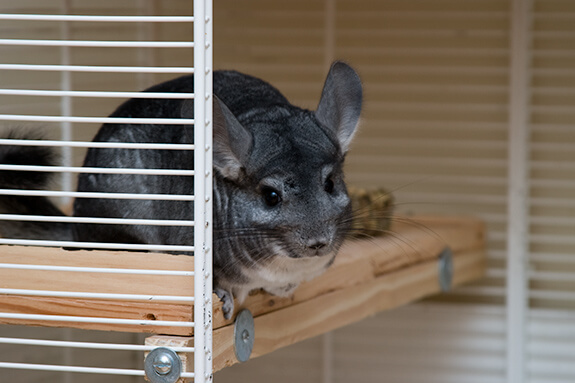 ), if we were to get an second story add-on made to fit a 20 gallon tank, would that be enough for a chinchilla? We didn't really measure the space in between shelves. It was driven more by what was going on the shelf. For example, the wheel needed a certain amount of room. And the sleeping house also needed a certain amount of room. The rest of the shelves "fell" into place. What a wonderful setup! I've looked it over carefully, made some calls around town to Lowes and the Container Store, drew a few sketches, and I've decided to try making one myself. With the materials I was quoted over the phone, my dimensions will be 36L x 20W x 36H. However, until I stop in to those locations myself, I wont know for certain. You said yours was four foot high, but do my remaining dimensions seem accurate? I have a 3'x2.5'x2.5' cage(Yes, it's small) and it's a single level cage. I couldn't afford a bigger one =(. So I was wondering if you guys had ideas for creating a second-floor on the cage? We built the cage from scratch so we could control the dimensions i.e. as big as possible, but still get through the doorway. It wasn't cheap at all and I doubt a good option for your efforts. As for pictures, we don't have any more to post. Sorry! just wondering. how much does constructing a cage like that cost you. and is there any ways of preventing the chinchilla from biting the mesh wiring and if you can post more pics. i would greatly appreciate it. im making cages for goodwill children. and i like this one alot. We are looking for female chinchillas for our boys poto an coto. Poto is a little more friendlier than coto he loves to be touched his characteristics everything that comes into the cage must be investigated. Eats everything I haven't found anything that he doesn't like. sleeps in various positions on his back with his legs wide open, on his side, he may even go inside the hut and sleep with his head out and his back legs out as well dont ask me I dont know how he does that. Coto more of a anti-social doesn't eat everything like poto, but he is very particular on how the hut must face and what is inside the hut. Anyways, I wanted to find out where to go to get a female or two for these guys I know that one may be better off than the other but I need an idea. I wanted to build a cage for our chinchilla and think this is EXACTLY what I was looking for. Could you tell me if there is a coating on the wire that you used? I wasn't sure if your chinchillas ever chewed on it or not. (Just wanted to check exactly what you used so I didn't go out and buy the wrong thing). Thanks so much!!!! Sorry, we don't have the blueprints for the cage. We just had rough sketches which we tossed once the cage was completed. I am TOTALLY in love with your cage! We currently have 9 chinchillas, 7 boys and 2 girls. Ultimately we want to put 6 of the boys together (one is still too aggressive, four are in bonded pairs) and one of the girls (who is sterile) in a large cage like that. If I could I'd put them all together but, like I said, one is still too mean and the other girl (who we bought thinking she was a he) is likely pregnant and rather than have MORE chinchillas after this round, we'll have to keep her separate too. I've bought (and been given) a lot of cages for the chinchillas, most with plastic parts, and by and large, they'll chew them to bits. Even the non-plastic chewers have nibbled on the shelves, and the cages just seem too flimsy. I may built a cage using the caging itself, but not the same shelves, tubes, and ramps that came with it (all cheap plastic). Do you have a blue print of how you put all this together? You are correct that there are some safe woods and some unsafe ones. We used pine for the cage shelves. It wasn't kiln-dried, but we limited the number of edges that could be chewed on. We also provided as many alternative chewing toys as possible. I think part of the problem with non-kiln-dried pine are the "fumes" that come from it when it is in the form of bedding. I would assume solid wood would be less problematic. We changed the bedding every week or so. To keep from wasting too much bedding, we used a wooden tray to hold it. The tray was about a third of the size of the cage bottom. We could take the tray out as needed. The bottom of the cage would be cleaned every other week. The wooden shelves would be cleaned as needed with vinegar. Building a cage seems to be more expensive. The advantage is you get to build it to suit your needs. For example, we wanted a big cage, but we needed it to fit through a doorway. We don't know if there's a particular amount of space that will keep male chinchillas from fighting. It's probably best to devise some sort of system to divide the cage and maybe let them run around together outside of the cage. Hello. I just adopted a chinchilla from a friend of a friend and inherited a rather small cage. I figured out pretty much how to build a cage like yours but have read to watch out what kind of wood. I read you used pine wood for the shelves. Did you buy the wood at a place like Home Depot or did you get it from a specialty lumber yard? I have read on other sites that the pine must be kiln dried and untreated and I am unsure if that is what you get at your local Home Depot or Lowe's. Also, how often do you clean the bottom? When you clean out the bottom do you remove the bedding too that has been peed on? Thanks! This cage is lovely. Do you find it is cheaper to build a large cage or to buy a cage and modify it? Also I have been considering building a habitat for my 8 chinchillas, something large and zoo quality, but I was a little concerned about housing more than 1 male in the same cage with my females. I was wondering how large a space would be needed to assure my males would not fight. Hi. I have never owned a chinchilla before but have done a lot of research and may be getting a chinchilla soon. I read that you don't want to get plastic cages because the chinchillas can chew and digest the plastic which can lead to future health issues. Is that correct? Or does it depend on the chinchilla? I was reading the reviews of certain cages on PETCO or Petsmart and some owners say their chinchilla chewed through the plastic while other chinchillas didn't at all. Also, this site was very helpful. ***EDIT:Melamine SHOULD be covered, because it may be toxic to chinchillas, but it is a better choice when compared to plastic. I forgot to say if i cage has heaps of shelves, they prefer to go on the higher ones! the only thing that goes on the bottom of my chinchilla's floor is poop!! Hi there, I just happened to be looking for something about chinchillas and i came about this forum. The other day I found this product. I haven't tried it personally but i looks pretty good. I used to be have a plastic coasted wire cage and my chinchilla used to nibble at it. Once i upgraded him to a bigger cage, we put heaps of wooden shelves and ledges and he hasn't nibbled on wire since. i think as long as ur chinchilla has something to chew on if he's bored he wont bother with wire/plastic. I am a college student and go home for long weekends. If I wanted to take my chinchilla with me would he be affected by being put in a different cage? There is nothing stopping our chinchillas from eating the wire covering (it's paint and not plastic). And in fact they did attack one small area. But with enough alternatives like wood and hay cubes, they were sufficiently distracted. You can buy thin pieces of aspen. They do warp in humidity though and aren't easy to clean. Melamine is another option. Easy to clean, but doesn't provide traction for your chins. We used melamine as the base of our cage, but with multiple levels our chinchillas didn't spend much time on the base so we didn't worry about traction. Spraying the wires may prevent chewing, but I'm not sure you could do it such that just the wires are covered. It'd be a shame if wherever your chinchillas went they encountered bitter apple. What is keeping the Chinchillas from chewing and eating the plastic off of the wire shelving? Also, is it okay to use a 'bitter apple' product on the wire to keep the chinchillas from chewing on it? If your parents are going to put restrictions on the size of the cage, are they also going to not allow you to let your chinchilla run around outside of the cage? Daily exercise outside of the cage is important for keeping your chinchilla healthy. I want a chinchilla very very badly, and I don't think my parents will let me get one if its cage is too big. Is it possible to have a cage under 24x24"? Also, how much do you think the chinchilla will cost? The door uses a pretty low-tech system for staying place. Along one side are zip ties that hold the door upright and allow it to swing in and out. However, because the wire shelving is heavy, the door actually sits on the bottom of the cage and there's enough friction to keep it from moving unless you lift it first. The front melamine wall along the bottom of the cage has a door on hinges and a simple bolt style lock. I love the pictures of your cage and I'm going to have my teenage son build one this summer - it should keep him busy for a week (I hope). My question is how exactly do you keep the door from swinging in and out. I'm assuming your melamine box has a door on it too so that would keep the door from swinging out - but I don't see anything in your picture that would keep it from swinging inwards. Also, I'm not quite clear on how you attached your door - it looks like you just used the plastic zip ties on one side. Is that correct? We had built an outdoor cage for our chinchillas but we had just used a roll of galvanized small squared wire(fogot what it was called but it's in the gardening section at Home Depot - we didn't use chicken wire because I was afraid the chinchillas would be able to get through it. We use a staple gun to attach it to pine 1x2. The door was a bit of a problem and the wire isn't stiff enough to attach wooden shelves to like the wire shelving units you used in your design. Thanks for the additional ideas. I look forward to a better description of the door. Or if you could just take another pic that includes the entire door that would be great. I would also do what Chinchilla Planet says. I would replace all shelves with wood so that your chinchilla wont always be chewing on plastic. A little plastic likely won't harm your chinchillas, but ideally they wouldn't be chewing on anything other than the safe types of wood. We didn't have any luck keeping our chinchillas from chewing on plastic regardless of how many alternatives we offered. In the end, we just made sure that all shelves and such were made of wood. Urine can be removed from wood using vinegar. It's not 100%, but it does do a really good job. Thank you so much for all of your information and care for the chins. I have two and just love them. I had bought a large cage so they could live together, but they do not get a long. I now have one in a smaller cage and need to get a larger home for him. I love your design and thank you for sharing. I do have one question. How do you clean the urine from the wood? I do have another question my other cage is a 4 level ferret cage but has plastic shelves on the bottom. He has discovered this and chews on it all of the time. Is this harmful to him? Thank you again. Dry erase boards are different than the melamine we're using. Ours are wood fiber boards that are covered with white plastic. We got the wood boards from Home Depot. Where did you buy your melamine boards? Did you just use old dry erase boards? The "hinges" are just plastic zip ties that are positioned out of the reach of our chinchillas. What did you use for hinges and where did you get them? We have no specific recommendations. Wherever you buy a cage just make sure to inspect it for quality and safety. Reputable stores will let you return things if they're still in good condition i.e. unused so you can inspect things closely at home. Is there a place that you recomend to get the cages for your chinchilla or are most places good? As long as the room is safe and there's nothing in there they will chew on that you don't want them to chew on, the idea is fine. We let ours run around every night in a spare room. I am seriously thinking about buying a chinchilla, and was wondering, at night can we let it run around freely in a room? Of course it would be a small-ish room and doors and windows would be closed. If you don't have the room in your place for a cage, then you probably don't have room to let a chinchilla run around every night. It doesn't sound like you should get one until you're in a larger place. As for a bird cage, it probably won't work with a chinchilla wheel which would be even more important given your space restrictions. I've been looking into chinchillas for a while now. At the pet stores though I couldn't find any cages. I don't have the room on the shelf to get something as wide as a guinea cage, so would it be fine to just get a bird cage (I would prefer to not construct one, I'm not exactly great at that sort of thing) one that's not to wide but makes up for it in height and with platforms wouldn't it be feasible? i got a few questions, about building a decent cage. 1. roughly how much time does it take to construct? 2. i have heard that one should avoid adding anything plastic to a chinchilla cage as they like to chew on everything, and plastic in there stomach can be very harmful. yet most things for them are plastic like a running wheel, ball for walking around the house etc, does this mean you should not buy them? 3. how often do you have to replace the wooden shelving due to them soaking up urine and such? 4. whats the best type of wood to use? i have heard you should avoid things like cedar and elder wood at all costs as it makes them sick, and some wood is better for them than others? 6. finally whats the best way to secure the corners? as using plastic tie wraps does not see right, so should u screw it together somehow? or get someone to neatly weld the corners together? When we built it, it took us a day to gather supplies and two days to build it. Yes you need to be careful after your chinchillas chewing on melamine. The key is to make sure none of the edges are exposed inside the cage where they spend most of their time and are likely to chew on it. While there is some melamine on the outside of the cage that they could chew on we've found that once they're running around the room, they are more interested in doing other things. All of the chewable wood inside the cage is pine that is as dry as we could find. Hi - In the near future I will be adding a chinchilla to my family. Since I am a first time owner I have done a ton of research to ensure that my home and I are ready for the new arrival. I would like to build my cage and love your design however I have read that plastic is toxic. Isn't melamine a plastic coating? Will my chinchilla chew on the walls and get sick? We recently built this cage after finding it on the website. The cage is awesome and Stitch loves his new home. We were able to get all the supplies from Home Depot and the cost came in at a little under $200.00. We finished the cage a couple months ago and it has really helped our chinchilla be a lot happier. It's amazing how quickly he can fly from each of the shelves! We were a little nervous at first because he fell a few times, but he quickly adapted and it's become second nature for him. Thank you so much for the detailed descriptions. It was much better than the plans we would have paid for online. My advice to any chinchilla owner, is that the more room you can give your chinchillas the better. They are active little creatures and love to run and jump when given the chance. Plenty of wooden toys is a good idea too. Boredom causes stress in chinchillas, and lack of exercise due to a small cage can only be a bad thing. Don't be afraid to let your chinchillas out the cage. Just have to follow some simple rules: Keep doors and windows closed to avoid the chinchilla escaping. Keep other pets out of the room whilst your chinchilla is out the cage. Switch off any electrics and put cables up out of reach (chins will chew live wires and electrocute themselves otherwise). More any plants out their way, many house plants are deadly poisonous to chinchillas. Use raisins to lure your chinchilla back into its cage. Or practice gently picking up and holding your chinchilla. We may take more pictures sometime. What a mean by 5-sided is a basically a box without a top i.e. 4 sides and a base with no top. The shelves are attached by screws. Washers are used to help keep the screws from slipping between the bars of the cage. The wire cage walls are held together by zip ties. They're not the only things holding the cage together as the screwed in wood shelves also provide a lot of support. Hi. Thanks for the info. I was wondering if you could post a couple more pics? I would like to see the base of the cage in the front. That view is cut off from your photo. I would like to see what you meant by a 5 sided base. Also, how have you attached the outside shelving "walls"? With zip ties? Or have you somehow screwed them together?? are they quite stable? My chinchillas bounce of the walls in their cage and I don't know if zip ties would hold them up with all the bouncing and bounding they do. thanks again. I have finished my cage! It is great! My chinchillas went from a 2 foot high 1 wide and 3 feet long cage to a 4 foot long 20 inches wide and 4 feet high. They are very happy! THANKS!! The door is made out of melamine. It has two hinges on it so that we can open/close it along with a dead-bolt to keep it closed. Melamine can be purchased from Home Depot or other similar stores. As for more photos, we didn't take any while were building the cage so we can only post pictures of the finished product. It's on our to do list! Where do you buy melamine? How did you make the door? Also how did you attach the outside of the cage together? I am trying to build a bigger cage for my chinchillas. Do you think you could post more pictures of your cage?Thanks. To be honest neither of us remembers what size the melamine came in. We don't have a machine to make rip cuts so even if we did need cuts, we undoubtedly had them done at Home Depot before we brought the wood home. Good luck with your cage building project! I'm going to attempt this. Looks fairly easy to build. Was the white shelving standard size or did you have to cut it to fit? Regardless I will just cut the melamine to work with the shelving size. I'll take detailed photos and send them to you when I finish. Thanks a lot! The body is made of shelving like the kind you can get from the Home Depot and the Container Store. What is the body (the white stuff) of the cage made of? I would also like to know what web site to go to where you got your walls and ceiling? Chinchillas, for the most part, don't bite. They only time ours have bitten us is when our fingers have had raisin residue on them. Even then the bite didn't pierce the skin and didn't hurt for more than a split second. There's no good way to catch a chinchilla that is on the loose. You might be inclined to grab them by the tail, but we don't recommend that. Rather than trying to catch them, we prefer to get them to move back to their cage. After doing this a few times your chinchilla will learn that when they are being "chased" they can "escape" by running to their cage. How do you catch them when they are loose. I haven't tried to let mine go yet. I am afraid to. I don't know if he bites or not. Do they bite? What would a bite feel like. We considered using melamine for the shelves, but decided against it. To use melamine, we'd need to protect the edges somehow so that it couldn't be chewed. But you're right, melamine would be much easier to clean and would likely last longer than the pine shelves we settled on. Aside from being safe, the shelves also offer a back up for providing ways for our chinchillas to keep the growth of their teeth in check. Despite providing many alternatives, our chinchillas chew on the shelves. I love your cage. What a great design. I like the fact that you can open the door and walk in to clean. No bending and contorting your body to get those store bought cage shelves cleaned. Was there a reason that you didn't use Melamine for the shelves. Wouldn't that be easier to wash down than the pine shelves. I'm thinking of building something like this and thought about melamine for the shelves instead. Please advise. Thanks so much for your web site and for showing off your terrific cage. That is a fairly common size for a chinchilla cage. It fits in to the category of what we consider to be a starter cage. Our opinion is that it is small especially if you need to be away for a few days and can't let your chinchilla out to run around. However, at the same time we are aware that chinchilla ranchers often use even smaller cages with seemingly no ill-effects to their chinchillas. I found a cage that was about 32" l x 20" w x 21" h with three stories. Would that be big enough for a chinchilla? We use a bagless vacuum to clean the cage. A bag would be easier to clean, but they would fill up so fast that we'd need a large supply of them. We've given up on trying to keep all the chinchilla droppings in the cage. We let the chinchillas run around in the room with the cage so the attempts were a waste of time in our case. The short shelves are single pieces of wood. They sit on top of wooden rails that run the length or width of the cage. The long shelves started off as single pieces, but we cut them into 3 pieces so we can put them into the cage and remove them for cleaning as necessary. The rails that the shelves sit on are screwed into the side of the cage with a thick screw and washer. We're going to have to take more pictures I think. Do you just shop vac the bottom of the cage? Also, how did you attach the "sides" of each of the shelves. Right now, I'm battling with my chinchillas to keep as much poop inside the cage as possible. Also, how did you attach the shelves together, in the corners for example? Thanks. I love your cage. It seems a very simple design, yet very lovable for the chinchillas. Unfortunately we built our cage many years before this site went live. It didn't occur to us to take photos during the construction process. However, if you have specific questions, feel free to post them here and we'll try to answer them. Too much info on what you did and not on how we should do it. You should put a picture section on the website. Try Canadian Tire or Home Depot. Those kinds of stores should carry the same sort of wire shelving. At first we just used a bunch of thick zip-ties to hold all the pieces together. Our chinchillas kept chewing the zip-ties though and we had to keep replacing them. After some thought we came up with a better solution by using pieces of wood that run length-wise and width-wise the cage. These pieces of wood are attached to the cage walls with bolts and washers. We also place the pine shelves on top of these. I've posted one more photo above that I hope sheds a little light on what I wrote. I live in Canada though so I have not heard of the Container Store... Do you know where I could get the wire shelving in Canada? Also, what did you use to attach the wire shelving? Our cage is 4 feet wide, 4 feet tall, and 2 feet deep. The base which you can't quite see in the photo is made of melamine, the shelves are pine, and the walls are wire shelving from the Container Store. As for cost, we sort of lost track. It was by no means cheap and may have approached $200. The good thing is that it has lasted 6 years and except for putting in new pine shelves, we haven't had to replace anything. I've been looking for ideas of building my own cage for my chins. I really like the cage that you have pictured on your chinchilla cage post. I was wondering, how much did it cost and what materials did you use? Also, what are the dimensions of the cage?